Samsung Galaxy S9 Features and Get Started - What is the Samsung Galaxy S9 new features and how to setup and get started with all new AR emoji, Super Slow motions camera, Dual aperture and Bixby live translate. Everything we know about Samsung Galaxy S9 and Galaxy S9 Plus we share free for you. These phone price $719.99 (about AU$1310) about £739, you can get SIM-free directly from Samsung, but currently unclear. Official Samsung Galaxy S9 best deals today on release date February 25 2018 can be pre-order and the phone will hands from March 16. If you want to buy in pre-order it from 7PM GMT on February 25 after the launch event. Samsung has confirmed the price of the Galaxy S9 in the UK at £739 and $719.99 in the US (about AU$1310). Right now we don't know pricing for Australia, but we'll update this piece once we hear more. The Samsung Galaxy S9 have a major improvements over the display on the Galaxy S8 up to 5.8-inch QHD+ Super AMOLED display with a resolution of 1440 x 2960. Galaxy S9 claims the design improvements for the phone include the iris scanner hole being hidden, as well as less bezel at the top and bottom of the display. One of the big problems Galaxy S8 was the strange placement of the fingerprint scanner on the rear of the phone right next to the camera, and Samsung has moved the fingerprint scanner Galaxy S9. There's still a 3.5mm headphone jack on Samsung S9, hardware locations on the bottom edge of the phone on the left-hand side. The USB-C still available for charging and data transfer, and upgrade stereo speakers systems. The new speakers will allow the S9 features Dolby ATMOS surround sound technology to be 1.5 times louder than the Galaxy S8. This cell phone IP68 waterproofing make you can handle the odd drop in a puddle without immediately damage S9 in the internals. 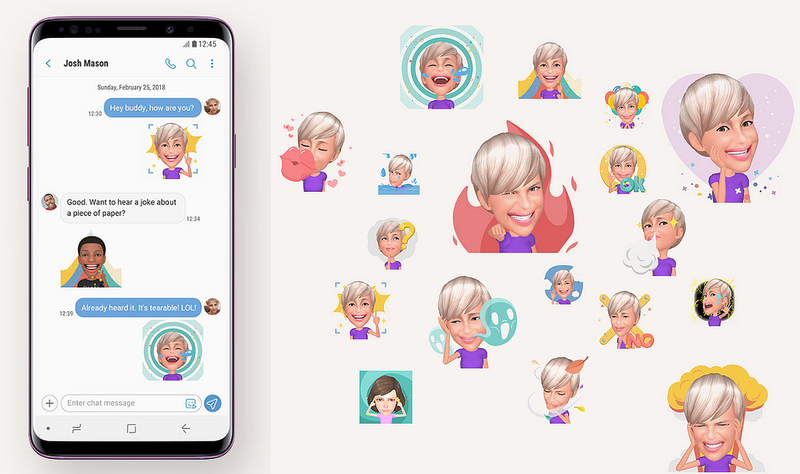 Samsung S9 AR Emoji are communicating people with images than ever before, so it has made its own feature called AR emoji Galaxy S9 similar idea to the Animoji feature available on the iPhone X, but this allows you to make your own character and give it different hair colors, dress senses, 12 different clothing options and choose from 7 pairs of glasses. AR stands for augmented reality and this feature uses the front camera to take a selfie and make an emoji based on your looks. 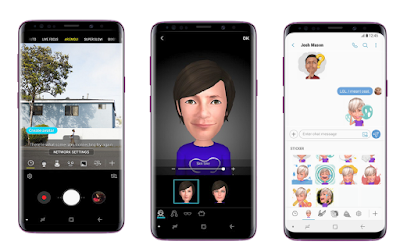 Manualy you can get started use Galaxy S9 camera and move your face to make silly videos, then choose one of 18 different emotions pre-built into the AR emoji app so you don't always need to pull a stupid face into your phone to be able to send one. The new Galaxy S9 slow-mo features of the rear shooter have also been improved so you can now shoot at 960 frames per second, which is four times slower set by Sony phones. Super Slow motions camera mode S9 uses something called automatic motion detect, which will automatically begin to record when the camera detects movement, so it should make it easier to only record the relevant moments in slow motion. Dual aperture is the widest ever aperture in a smartphone, and Samsung claims it should enable you to capture images with more color and detail, and much less noise in low light conditions. S9 Camera automatically adjust to f/2.4 aperture, and if it's darker than that the camera will opt for the f/1.5 aperture if you're shooting something brighter than 100 lux (which is usually daylight). There's a 12MP rear sensor with optical image stabilization, and a lot of the other features upgrades is new dual-aperture technology, with the camera automatically adjusting the aperture depending on the scene you're shooting, in any light adopted like the human eye to changing light. This camera also plays into the facial recognition technology on the front of the phone there's an 8MP shooter with an f/1.7 aperture. The Galaxy S9 Plus get new Bixby Vision camera get enhanced beauty mode, so you can change the look of your selfies too. Samsung Bixby Vision project is a big improvements from Samsung company. When you're in the camera app you can tap the Bixby option to access a variety of different new features, including tracking the place you're in provides the name and details of where you are while use Galaxy S9 Bixby you can pointing it at food, at which point it will try to work out what it is and even estimate the calories before you get deals. Samsung Bixby Live Translation that allows you to put the camera over a menu or text and auto translate it. You'll need an internet connection and to wait a few moments for this to work, but it's an interesting addition that may come in useful when you're traveling. For Galaxy S9 desktop-like experience, turn your Galaxy S9+ into a touchpad by connecting it to DeX Pad and a monitor. Access the photos and files on your phone as well as check email, surf the internet, and more on a full-size screen. The Galaxy S9 a 3,000mAh battery to power it along on a daily basis and the Galaxy S+ have 3,500mAh. Both of the phone support wireless charging technology to use a variety of different pads to charge up your phone without plugging it in. S9 fast charging got from the official charger to ensure get full power into your phone in the minimum amount of time. When you’re on the go and there’s no outlet in sight, plug your Galaxy S9 or S9+ into this Portable Battery Pack to give your phone a boost. It’s compact enough to slip into your pocket or purse but packs a powerful punch with the 5100mAh capacity. You can insert a microSD card for up to 400GB of total storage on your device, inthe inside only 4GB of RAM in each version of the phone, for 6GB you'll have to opt for the Galaxy S9 Plus. As for storage, the Galaxy S9 only comes with 64GB of onboard space, but you can add in microSD cards for up to 400GB of amazing extra space.